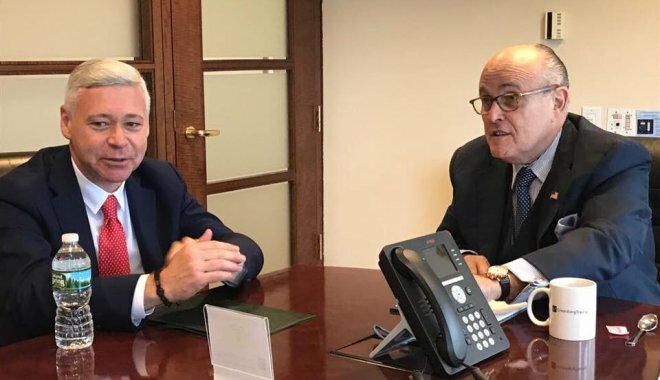 NEW YORK – Vitaly Pruss, President of TriGlobal Strategic Ventures, reports that the meeting between the official delegation from the City of Kharkiv, Ukraine and former New York Mayor Rudolph Giuliani and John Huvane, CEO of Giuliani Security & Safety, was a success. The City of Kharkiv was represented by First Vice Mayor Igor Terekhov. During the meeting Mr. Terekhov expressed gratitude to Mr. Giuliani from Kharkiv’s Mayor Gennadiy Kernes for assisting in organization of the visit of Kharkiv representatives, with the aim being to study the setup and experience of the Offices for Public Security and Offices for Emergency Management in the states of New York and New Jersey. The parties also discussed the areas of future cooperation with the goal of establishing and operating a new Office for Emergency Management in Kharkiv. A separate topic in the meeting was devoted to discussing software development issues related to the United States Centers for Emergency Response. Moving forward, Giuliani Security & Safety will provide expert assistance in creating an Office for Emergency Management in Kharkiv. TriGlobal Strategic Ventures, a New York-based business development company which facilitated introduction between the City of Kharkiv and Giuliani Security & Safety, is going to be involved in future cooperation with potential partners and investors as well. For more information on TriGlobal Strategic Ventures, please visit http://tgsv.net/.